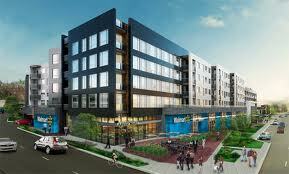 Ft. Totten Square, a mixed used development, will open to the public late 2014. There are already questions arising about affordability from RIggs Park residents. When members of the DC Council broke ground on the site of Fort Totten Square in late January, they lauded the mixed-used development as the right step into the 21st century. Onlookers, including longtime residents of the Riggs Park in Northeast and passersby, begged to differ. Fort Totten Square signified gentrification finally reaching their doorsteps. The longer D.C. underwent urban redevelopment, the harder it became for longtime residents to afford the city’s rising cost of living. DC Councilmember Kenyon McDuffie (D- Ward 5), a speaker at the groundbreaking, acknowledged the need to strike a delicate balance between economic development and affordability. In an interview with the Washington Informer, he said that “[the DC Council and other city officials] have to ensure that the market is conducive to bringing people to this location.” That goal, while noble, does not address what is at the center of growing socioeconomic disparity in the District – education or the lack thereof. If someone is poor, unemployed, and dependent on city services in the District, it’s very likely that they are not prepared for a job market that has gotten more technological and information based. While job seekers with STEM, public policy, and other degrees have no trouble finding work in the District, the unemployment rate for young, uneducated black men living east of the Anacostia River is approximately 17 percent. At a time when there is so much attention on the quality of D.C.’s public and charter schools, Mayor Vince C. Gray has an opportunity to expand access to quality early childhood education and other amenities demanded by residents in affluent neighborhoods. Mayor Gray outlined this particular goal in a 60-page document known as the “One City Action Plan.” If this portion of the plan comes to fruition, the District will expand access to quality education to children across the city, regardless of socioeconomic background. Residents saw the first stages of this plan last spring when Mayor Gray launched Early Success. This framework has linked parents to experts and opportunities that strengthen their role in their child’s education at an early age. Under the plan, early childhood education options are expanded to children living in low income communities. Like their affluent counterparts, these children would have a head start to a life of academic and professional success. The plan also ensures that students in D.C. Public Schools and D.C. Public Charter Schools are prepared for careers that are congruent with their interests. In addition to college preparatory course, students will learn vocations from which they can choose a career path. The plan also aligns the D.C. Summer Youth Employment Program with local training programs to give teenage employees a well-rounded ‘on the job’ education. Some ask what is to become of the 40,000 students in D.C.’s public and charter schools. Under Mayor Gray’s plan, all school buildings will undergo modernization and services will improve in the District’s 40 lowest performing schools. For young adults that are homeless, former juvenile offenders, and unemployed, the plan increases wrap-around services that include job training and preparation, and GED attainment. In implementing this part of the plan, Mayor Gray hopes to connect employers and social services to coordinate the transition of teenagers into an adulthood of independence. Poor residents, marginalized from areas of opportunities, are victims of inadequate schools, lack of city services and health food options. Ongoing violence and a growing drug trade are manifestations of the lack of options awarded to the District’s poor. When urban redevelopment reaches the District’s most impoverished parts, poor residents will be priced out and forced to move to another low income community where they will face similar problems. As the rest of the District undergoes renaissance, inner city communities are caught in a cycle of poverty that is never ending. This is the recipe for what William J. Wilson calls spatial mismatch in his book, “More Than Race.” Education has long been regarded as a protective shield against wrongdoing. This case is no different. If the Gray Administration wants to realize its vision of ‘One City,’ it has to ensure that all children, especially those from lower income communities, receive quality educational opportunities. In an era of growing socioeconomic disparities, equalizing access to quality education provides all children with the same opportunity to learn and eventually increase their purchasing power in an improving city.